The faster customers receive their online orders, the happier they are. Happy customers mean repeat customers. So what’s the key to creating a great customer experience and ensuring brand loyalty? An impressive fulfillment experience. 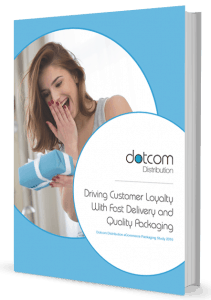 In our 2016 eCommerce Packaging Study, Driving Customer Loyalty With Fast Delivery and Quality Packaging, we dive into what customers really want out of the fulfillment experience and how that, paired with packaging quality, plays a key role in making them return to your brand. Discover eCommerce packaging insights relevant in 2019 and beyond! Fill out our form below to download your copy of the 2016 eCommerce Packaging Study today.